Many people have just recovered from Thanksgiving feasts and shop-a-thons without any consideration for VBS this summer. 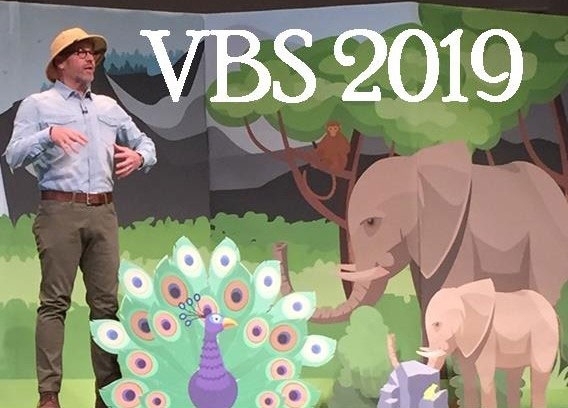 Others, like me, are scheduling dates for VBS 2019 to get the dates on family calendars so they can schedule trips around VBS instead of being gone during VBS. Dates for enlisting my leadership team, enlisting teachers and volunteers, reserving vehicles and building space, and, yes, gathering ideas for decorations. 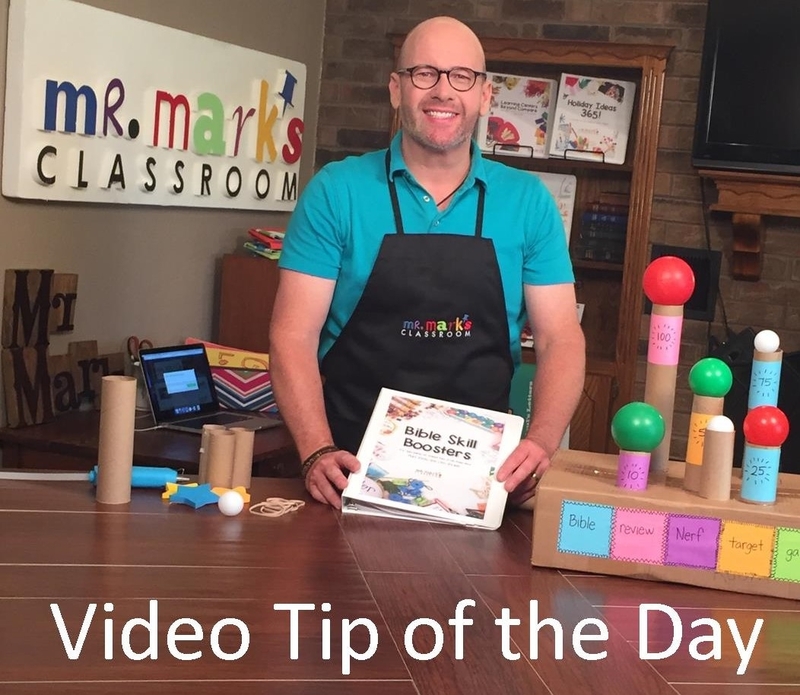 Today, Mr. Mark’s Classroom reveals our 2019 VBS decorations that are sure to create excitement for kids and leaders alike. If for some reason you have VBS funds remaining, we are providing this option early since our budgets start over in January. All the items are in stock and available in our store so click HERE to see them all! 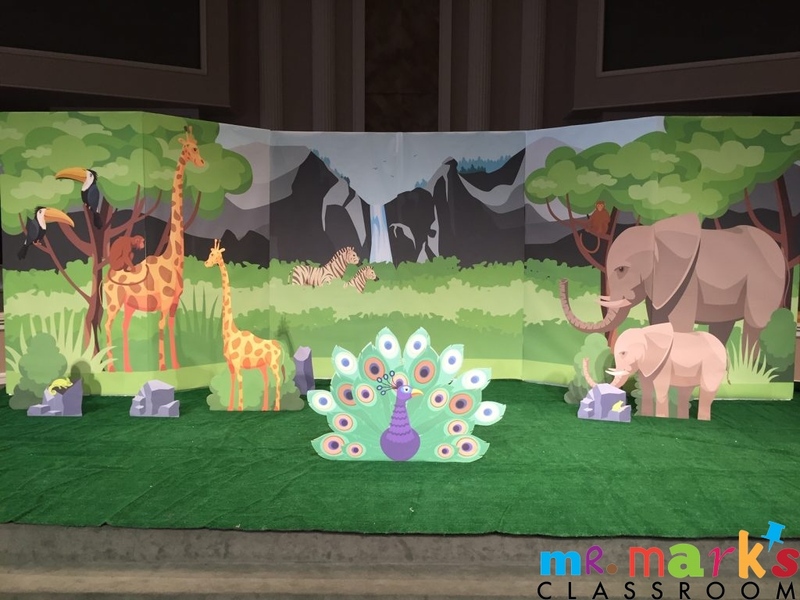 Featured today is our Large Safari Scene Setter. This 24-foot-wide scene comes with seven panels. They are printed on quality paper and easily attaches to foam construction panels purchased at Lowes. These printed panels are not stickers, since so many churches preferred the option to use them in decorating classrooms and hallways after the big event. The paper and the foam panel love Mavalus Tape and it seems to be the only reliable tape that does not destroy the poster or walls. The panels measure 8’ x 4’ and will extend slightly past the edge of a large sheet of construction foam panels to allow you room to match the edges and create and accordion fold when standing the panels on stage. 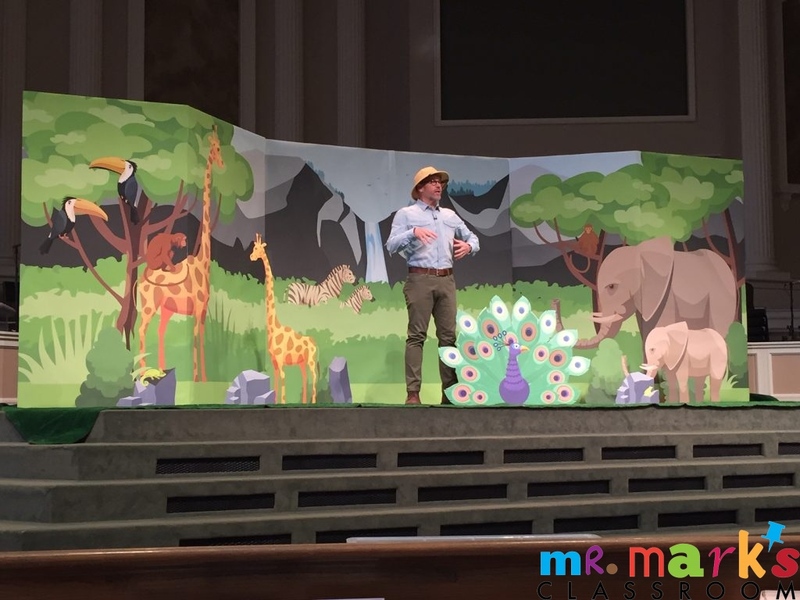 Two panels create the large 7’ tall giraffe with monkeys and a toucan bird. These posters are filled with bright green foliage, grasses, and trees. The two middle panels feature the mountains, beautiful clear sky, waterfall, grassy meadow with a couple of zebras. The final pair of panels feature a large elephant and a monkey among the grass and trees. The seventh panel of the Large Safari Scene Setter is filled with scene add-ons to bring your stage to life. 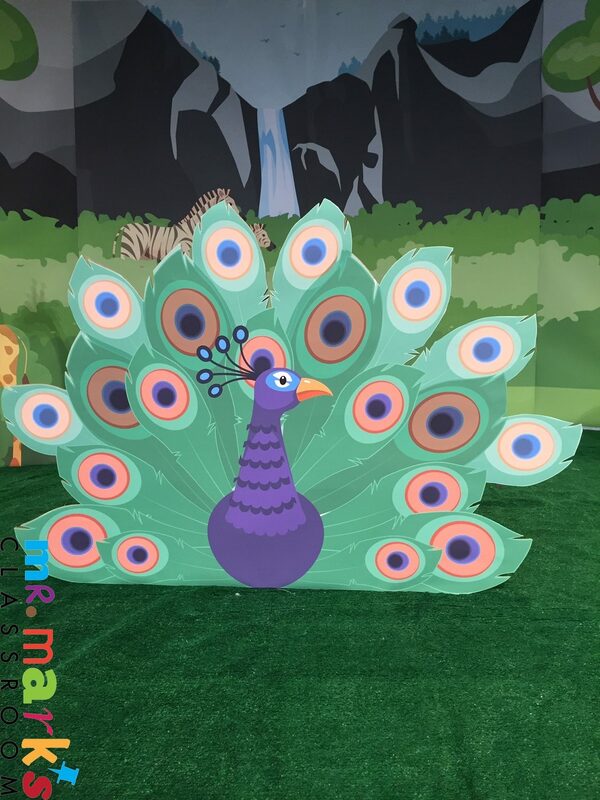 You will find a baby giraffe, a baby elephant, extra toucan bird, rocks with a bright green frog and iguana, and a beautiful four-foot-wide peacock to add to your scene. Simply cut the items out loosely with scissors and attach the pieces to cardboard or display foam board from Hobby Lobby. Mr. Mark used cardboard. Just know you can open large boxes flat and use for individual pieces to reduce expenses. After attaching an item with Mavalus Tape, use a sharp blade and cut the item out. Add a small triangle as an easel to the back with tape. Be sure it is not flush with the bottom, but rather a finger width from the bottom so the piece will lean back slightly instead of falling forward every time someone walks by it. 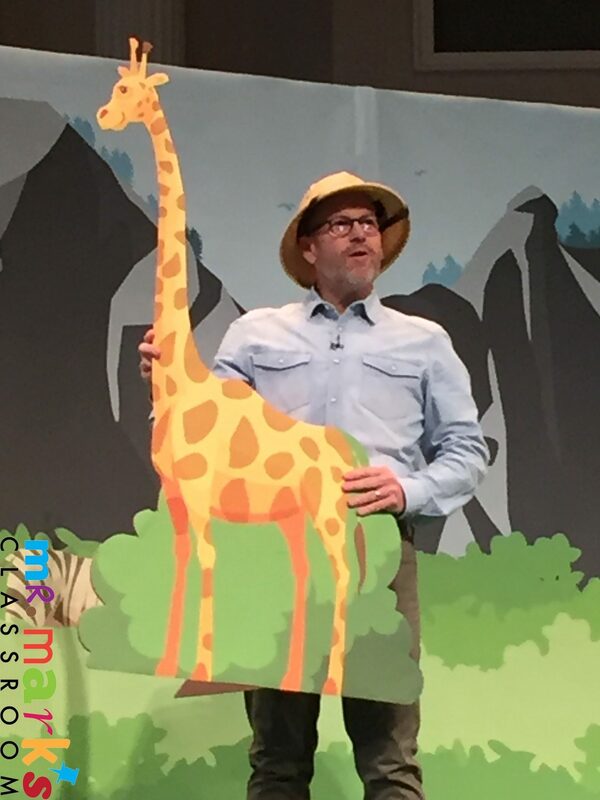 Consider the large Safari Jeep with Cats as a stand-up decoration for kids to be photographed with friends at VBS. Or set up the jeep scene at your teacher training event and provide pith helmets and binoculars as props to wear for a photo. Post the pics and invite more adults to come join the fun as we serve in VBS!